Chef Matt Tropeano of La Silhouette restaurant in New York City tempts the palate with his inspired recipes of White Asparagus & Artichokes, Slow-Poached New Hampshire Heirloom Egg White Asparagus-Mascarpone Puree, Truffle Vinaigrette, Herb Bread Crumbs; Foie Gras "A La Botero," Sweet Plantains, Salt Roasted Pineapple Coulis, Coffee Gel; and Pork Chop with Chanterelles, Puy Lentils, Apricots, Thyme Sauce. I first met Chef Matt Tropeano when he catered the cocktail reception which Edward and I attended as part of the New York Culinary Experience 2012 hosted by New York magazine and The International Culinary Center in April 2012. 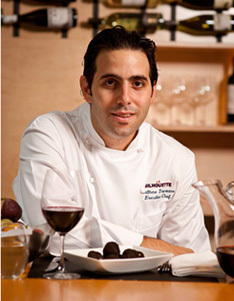 Intrigued with his culinary style and vision, we had dinner at La Silhouette restaurant in May 2012, and were definitely impressed. He is a chef who grew up in the kitchen, beginning as a busboy in his cousin's restaurant, Ristorante Primavera in Millis, Massachusetts. Within a year working at the restaurant, he was cooking, where he remained for the next four years. He continued his culinary education attending Newbury College where he learned classical French cuisine. To practice what he was learning at culinary school, he worked at The Bay Tower Room in Boston, Massachusetts, where he was promoted to sous chef after six months. He also met his now wife, Andrea, who also worked at the restaurant. A man on the move, he honed his career as a saucier at Nana Restaurant in Dallas, Texas working under Chef David McMillan, followed by a move to New York where he worked at the restaurants, Fiamma, and La Grenouille. By age 24, he was the executive chef at La Grenouille. He joined La Silhouette as the executive chef in 2011, where his focus is creating "every dish on the menu is something that I would want to eat." He buys the best ingredients and prepares them simply. His focus is on great food, with a comfortable atmosphere. He is proud of the restaurant's sauces, which he said are the backbone of a French kitchen. While the restaurant is not a true French restaurant, there are elements of there, and definitely French technique. Chef Matt's favorite ingredient is garlic; he makes a garlic confit at the restaurant by blanching the garlic twice and then cooking it in olive oil. His father told him that if you have olive oil, garlic, and pasta, you could have a meal. His wisdom for future chefs is to go into it 120%, be open-minded, learn as much as you can, and if possible travel to Europe. To appreciate great American wines, he believes that you need to understand old-world wines. Talking about the evolution of recipes at the restaurant, he believes that the best dishes are collaborative efforts working with his team and listening to their feedback. "It is not just me, but the sous chef, and the cooks as well." Chef Matt came to New York because of the restaurant, Lutece, and purchased the cookbook. At the New York Culinary Experience, he had the experience of working with pre-eminent Chef Andre Soltner, a chef he very much admires, to create a very special dinner, which was a most memorable evening. His passion is gardening, he grew up with a garden, and now has a garden at his home in Secaucus, New Jersey where he lives with his wife Andrea, and children, Sophia age 7, and Sebastian, age 4 ½. His free time is "family time," and he loves to cook with his children. As for budding chefs in the family, Sophia spent a day the restaurant as part of "bring your child to work" day, and she loved it. After his sister's foray into the restaurant world, Sebastian decided he needed to go to work with daddy, as well, and spent a few hours at the restaurant. Chef Matt Tropeano graciously shares his recipes for a delicious look at the vision of La Silhouette. Method: Cut the lemons in half and juice into a bowl. Whisk in the olive oil. Slice the white asparagus thin on a mandolin and marinate in the lemon olive oil. Arrange the asparagus on each plate side by side. Top each plate with five artichoke quarters. Slice the prosciutto very thin and place five pieces on each plate. Add 5five pieces of ramps to each plate. Place the mache scattered on each plate. Add the hazelnuts to the dish. Finally add salt and fresh cracked pepper, a little more lemon vinaigrette, and finish with a light dusting of fennel powder. Parmesan baked at 350° for 10 minutes on a sheet pan to make a "tuille"
Method: Mix all ingredients. Blend in a food processor, and reserve. Method: Blend vinegar, egg yolk, and Dijon mustard in a blender. Slowly add in the olive and canola oil. Transfer vinaigrette to a bowl and whisk in salt, white pepper, and chopped truffle (do this in a bowl, not in a blender so that truffle stays chopped, not puréed). Transfer to a quart container. Method: Bring 2 quarts of salted water to a rolling boil. Place the white asparagus in the water and cook 5-9 minutes depending on the thickness of the asparagus. Once the asparagus is tender, remove from water and place it in an ice bath. Trim the asparagus tips about 2 inches from the top of the tip. Puree the asparagus bottoms in a blender with the mascarpone and parmesan. Heat the purée in a pot, cover, and reserve for use. Method: Place the eggs in water at exactly 162° F, and cook for 1 hour. After 1 hour, carefully remove the eggs from the water and place them in a bowl with lukewarm water. 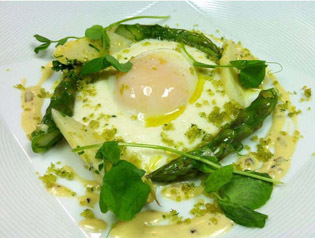 To Assemble Dish: Place the asparagus purée on the bottom of the plate, put the asparagus tips around the purée. Gently crack the egg open and slide the egg on a spoon. The egg will be beautifully soft and custard-like. Place on top of the purée. Top with salt and cracked pepper. Dress with the vinaigrette and then sprinkle the breadcrumbs over the dish. Method for the Pineapple Coulis: Cut the stem off the pineapple. In a pan, cover the pineapple with kosher salt. This will take about 2 pounds of salt. Cover it with aluminum and roast at 350° F for 90 minutes. Take out of the oven and peel the pineapple. Cut slices and discard the core. Blend pineapple in a blender until smooth. Keep hot and reserve for plating. Method for the Sweet Plantains: In a skillet, add 1-½ inches high of canola oil. Bring heat to medium. Add the yellow plantains and lightly fry until tender, about 10 minutes. Drain on paper towels, season with salt. Mash with a fork until well crushed. Place in a container and cover with plastic wrap, then reserve for plating. Method or the Coffee Gel: Boil 4 cups of water. Add the instant coffee. Add the agar agar, and whisk for 3 minutes. Transfer liquid to a cold container and refrigerate. When solid, put in a blender, then reserve for plating. Method for plantain chips: Slice four green plantains very thin on a mandolin. Fry in canola oil for 3 minutes, drain on towel, then reserve for plating. Method for the foie gras: Heat a medium sauté pan on high heat. Season both sides of the foie gras with salt and pepper. Add foie gras to the pan, sauté for 4 minutes on each side. Let rest on a paper towel. Plating Instructions: Place a spoon of the pineapple coulis on the plate. Add a few small dots of the coffee gel on the plate. 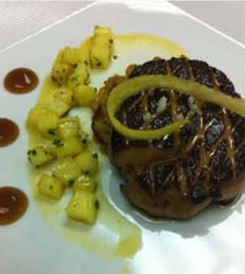 Place a few spoons of the sweet plantains on the pineapple coulis. Top with the foie gras, and top the foie gras with a plantain chip. Method: Combine all of the ingredients for the brine except the sprigs of herbs, bring the mixture to a boil, stirring, as soon as it comes to a boil, turn off the heat, add the herbs, and steep for 10 minutes. After steeping the herbs, strain the brine and let cool to room temperature. Once the brine is cool, add the pork chops, and refrigerate overnight. Place the apricots in a single layer on a clean sheet tray. Season with the salt, coriander, and white pepper; then drizzle with the vinegar and oil. Cover and marinate overnight. Method: Preheat your oven to 450° F and remove the pork chops from the brine and dry very well, the drier the pork chops, the better color you will get when pan-roasting. Place the lentils in a pan large enough to hold them with the leek, onion, carrot, garlic, and bacon strip and cover with cold water. Simmer gently until the lentils are tender. Remove vegetables and bacon, season well with salt to taste and cover to keep warm until you are ready to plate them. Heat a pan large enough to hold the pork chops without crowding the pan (there needs to be space between each chop or you will not get the best color due to steam) over medium heat until it begins to smoke. You may have to use multiple pans. Add oil and place each chop in the pan. Resist the urge to season the chop with salt and pepper; that is what the brine has been doing all night. Place pan in the oven and roast until the bottom is a nice dark brown. Flip the chops and return the pan to the oven until cooked through. Once cooked, let the chops rest in a warm place on a wire rack. Drain the oil from the pan, return to high heat, and quickly sear the apricots until slightly brown, approximately 30 seconds; remove from pan and reserve with the pork chops. In the same pan, add the chanterelles, shallot, and garlic. Season with salt and pepper once the mixture starts to brown. Seasoning before this point will cause the mushrooms to release water and they will not brown as well. Deglaze the pan with the sherry vinegar and reduce it until the pan is almost dry, then add the wine and reduce by ¾. Add the stock and the tied herbs and reduce it by half. Remove the tied herbs and quickly whisk in the cold butter off the heat. The sauce should be slightly thick and shiny. Plating Instructions: Place the lentils in the center of the plate. Place the pork chop on top. 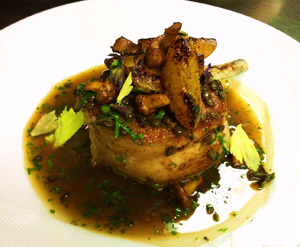 Spoon the thyme sauce and the chanterelles over and around the pork chop. Place the apricots around the plate. La Silhouette restaurant serves Lunch from Monday through Friday from 11:30 am until 2:30 pm, Brunch on Saturday and Sunday from 11:30 am until 2:30 pm, Dinner on Sunday and Monday from 5:00 pm until 10:00 pm, Tuesday through Thursday from 5:00 pm until 11:00 pm, and on Friday and Saturday from 5:00 pm until 12:00 am. In addition to the regular menu, La Silhouette offers a pre-fixe three course pre-theater dinner menu for $55, $75 with Wine Pairing, daily from 5:00 pm - 6:00 pm, and a later pre-fixe dinner menu for $79 per person (for entire table only), or $129 with Wine Pairing. Read about La Silhouette restaurant in the Restaurants section. Follow La Silhouette on Luxury Experience's Facebook page: www.Facebook.com/LuxuryExperience. 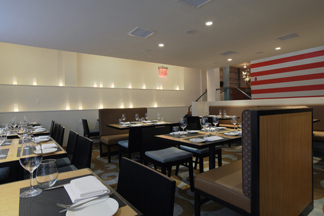 To make a reservation at La Silhouette restaurant, please visit the website: www.La-SilhouetteNYC.com and follow them on Facebook: www.Facebook.com/LaSilhouetteny. © June 2012. Luxury Experience. www.LuxuryExperience.com. All rights reserved.